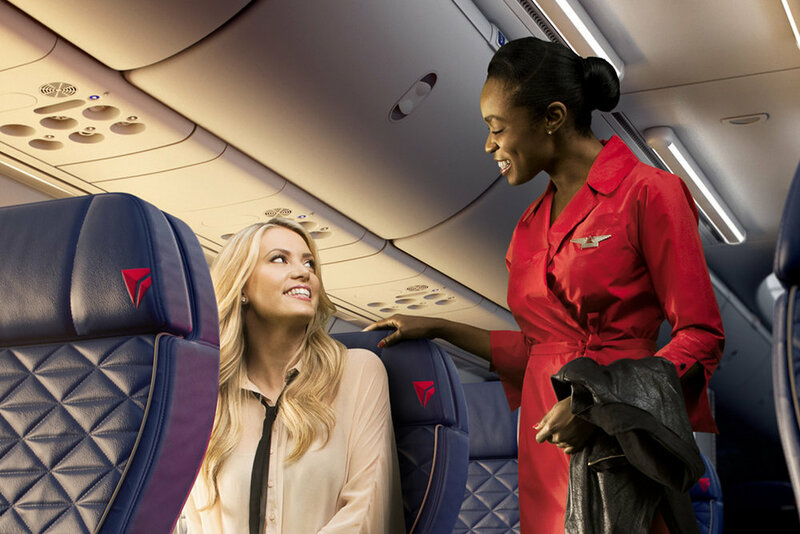 Every domestic airline is in endless pursuit of winning your loyalty, and Delta is no different. We love this, because it means that business traveler services and technologies are constantly evolving to make your life easier, on the road or in the sky. If you haven't had a chance to read our insider contribution about business travel from William Waldron at Delta Air Lines, you can find it here. If you’ve had a chance to experience the shiny, new Delta Sky Club lounges in some of the nation’s busiest hubs, you’ll understand just how helpful these spaces are for a traveler holding on to every ounce of productivity. Get fueled for your travels with healthy snack selections, refresh your brain at the Asanda Spa Lounge (note: free treatments for Diamond Medallion Members through July 31, 2018! ), and enjoy easy one touch biometric entry for CLEAR Members with a Delta Sky Club Membership in DCA and ATL. Need to make an important call? There are even conference rooms and fully equipped offices available to book. View more club updates here. If the optimal environment for sleep and work is something worth splurging on, the Delta One experience is available on long-haul international flights and in select long-haul domestic markets. You’ll enjoy 180-degree flat-bed seat, Westin Heavenly® bedding, 110-volt outlets and USB ports, a TUMI amenity kit, and more. If you just need a step above economy, Delta Comfort+® includes an extra 4” of leg room, dedicated overhead bin space and priority boarding. Don't fear being disconnected: Many Delta aircrafts feature fast WiFi and free messaging through Whats App or iPhone Messaging. If you can’t afford your devices running out of battery, head to seatguru.com to check if your seating class on a specific aircraft has power outlets or USB ports. It really helps to know ahead of time. No need to waste brain power wondering what your best option is for leaving the airport. Now that you can earn Delta SkyMiles for your Lyft purchases, you’ve got your new favorite transportation option locked and loaded. One less decision to make feels good, doesn't it? If you choose to fly Delta for your next business trip, we hope you get a chance to experience the benefits of these productivity-boostings options. Please don't let Brand USA lose its government funding. Didn't Get Back a Tax Return? Win a Free JetBlue Flight!